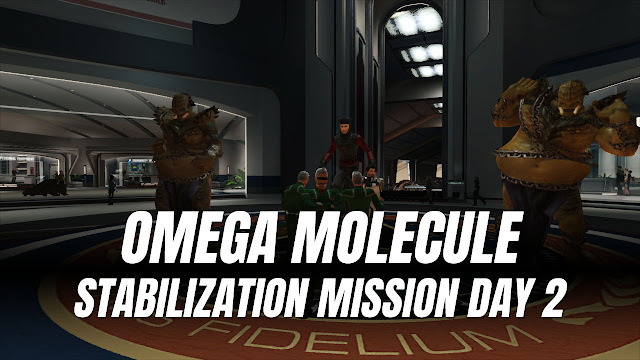 Star Trek Online 2019 • Omega Molecule Stabilization Day 2 - KABALYERO - PLAY, BLOG & EARN! Star Trek Online 9th Anniversary Celebration is on-going with Q's Omega Molecule Stabilization mission. Q is an all powerful being almost like a God and he is giving away a T'Pau Scout Ship T6 to anyone who will give hime 1000 9th Anniversary Prize Vouchers. Players can get these 9th Anniversary Prize Vouchers in Star Trek Online by completing the two new missions in Mirrors of Discovery and by completing the daily Omega Molecule Stabilization mission by Q. Want to see more? Help support the channel by downloading WTFast FREE (http://bit.ly/trywtfast) or by downloading Guns of Glory FREE (https://bstk.me/p5Ja9hdCg). Thank you for your support!